Under billions of tons of imports, the American dream is suffocating. The American people have lost faith. They know that bad trade has bled factories, middle class jobs and wage increases from the country. A report issued last week by the Economic Policy Institute (EPI) details how bad trade has cost Americans hope. And hope is the essence of the American dream, hope for a good, steady job with benefits and a pension, one that supports a family and a home, one that enables the kids to achieve even better lives. Bad trade has battered all of that. And more damage is threatened by pending trade deals and a so-called fast track process to approve them without in-depth deliberation. The EPI report, China, Trade, Outsourcing and Jobs, details the devastation caused by just one trade arrangement, the deal to allow China to enter the World Trade Organization in 2001. After that, the United States’ trade deficit with China climbed dramatically. As a result, EPI calculated that between 2001 and 2013, the United States lost 3.2 million jobs. Every state and every Congressional district except one lost jobs because of ever rising imports from China that were not matched by exports from the United States. 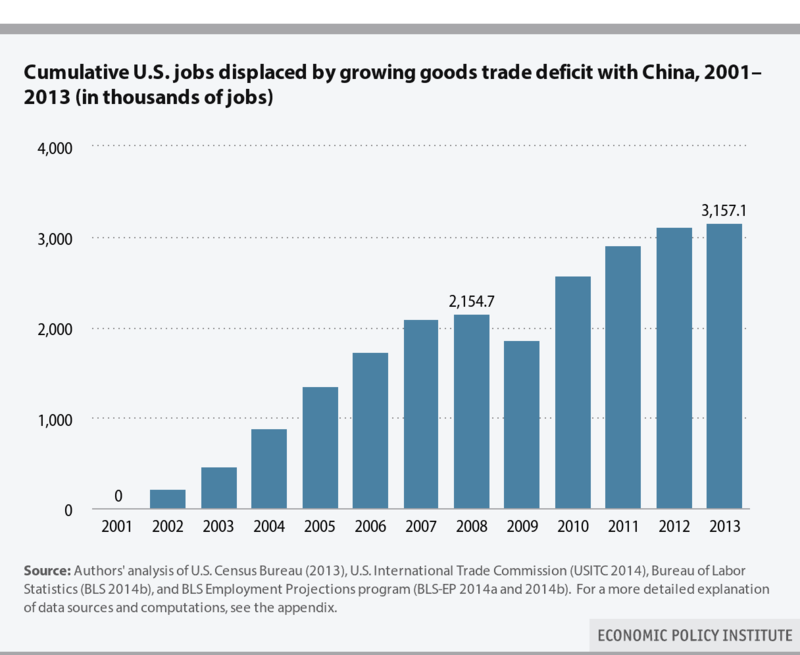 U.S. jobs lost because of trade deficit with China, 2001-2013, in thousands of jobs (EPI). And most of the destroyed jobs – 2.4 million – were good, family-supporting manufacturing positions. The workers jilted from those jobs suffered terribly. Those who could get new work earned less because pay for exporting industries and service employment is lower than that for jobs slashed by imports. EPI figures the net wage loss at $37 billion per year. In addition, trade with low-wage countries like China suppressed pay in the United States by 5.5 percent – about $1,800 a year – for full-time workers without college degrees. The nation has 100 million such workers. That loss to them and the U.S. economy: $180 billion. It’s gut wrenching. And Americans feel it. A New York Times poll released last week found the lowest level of faith in the American dream in two decades. Only 64 percent of those surveyed believed. Despite low gas prices, declining unemployment, and falling foreclosures, Americans perceive a shrinking future. That’s because virtually everyone knows someone who worked at a factory that closed. Frank Walsh talked to the New York Times last week about what it’s like to lose a good job. He hasn’t worked as an electrician in four years. He’s run up $20,000 in credit card debt and withdrawn $15,000 from his retirement account. “I lost my sense of worth, you know what I mean?” Walsh told the New York Times. He was among those polled by the Times, CBS News and Kaiser Family Foundation as they looked at the lives of the 30 million Americans aged 25 to 54 who are jobless. The share of unemployed men in this age group has more than tripled since the late 1960s. The poll found the 10 million men in this group unhappy to be out of work and eager to find new jobs. Like Walsh, they struggle with loss of income and dignity. Though skilled, Walsh couldn’t find new work that would enable him to earn what he did as a union electrician. Even for those willing to take minimum wage jobs, securing work isn’t easy, with 30 million unemployed people and 4.8 million job openings. Foreign competition means trade. And the problem for workers like Walsh is that there’s too much bad trade and very little done about it. My union, the United Steelworkers, has fought bad trade vigorously, filing cases repeatedly with the U.S. Commerce Department seeking sanctions against foreign producers of steel, paper, tires and renewable energy technologies such as solar panels. To win these cases, though, the law says industry and workers must first suffer losses and unemployment. And wins too often are quickly followed by new losses. Tires are a good example. The USW sought relief after imports of Chinese tires surged by 75 percent from 2004 to 2007. Four U.S. tire plants closed, destroying 5,100 jobs. Shortly after the USW petitioned for sanctions in 2009, three more factories shut down, killing an additional 3,000 jobs. President Obama imposed three years of tariffs, and the U.S. tire industry rebounded, increasing production and employment. But as soon as the sanctions ended, Chinese tire imports surged again, and U.S. production and jobs declined again. So the USW filed another trade case in June. A preliminary ruling by the Commerce Department determined sanctions were justified because China was providing improper subsidies to its tire makers. And that’s the point. American workers aren’t whining. They can compete with anyone in the world on an even playing field. But when foreign countries provide illegal subsidies, manipulate their currency, and hand no-cost land, no-interest loans and tax breaks to producers, then it’s bad trade. It’s trade that kills U.S. jobs and wrecks American lives. Producing in a country where exploitation of workers is permitted and environmental regulations are non-existent certainly lowers costs. But prohibited subsidies such as currency manipulation and tax forgiveness are much more significant. American workers need a new kind of trade agreement, one that protects U.S. industry and workers from bad trade practices before they close factories, destroy jobs and devastate communities. And yet, the United States is negotiating massive trade agreements with European and Pacific Rim nations in secret, so there’s no way to know if they are any different from previous bad trade deals. In addition, some supporters are seeking fast track negotiating authority under which Congress would relinquish its right to make changes. Congress must reject fast track and realize its duty to protect American industry and workers. It must end bad trade to revive the American dream.